Cubs Win Flag flies over the scoreboard at Wrigley Field shortly after the Cubs clinched the NL Central on September 20, 2008. The 2008 Chicago Cubs season was the 137th season of the Chicago Cubs franchise, the 133rd in the National League and the 93rd at Wrigley Field. The season began at home on March 31 against the Milwaukee Brewers. The Cubs were champions of the National League Central Division for the second year in a row, accumulating 97 regular season wins—the most since 1945. It was the first time since 1908 that the Cubs made postseason appearances in consecutive seasons. At the All-Star break in July, the Cubs led the NL Central and were tied with the Los Angeles Angels of Anaheim for the best record in the major leagues. They tied a National League record with eight players selected to the All-Star team. 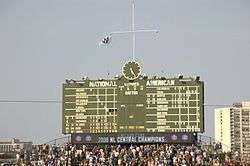 On September 20, the Cubs clinched the NL Central championship with a 5–4 win over the St. Louis Cardinals. Despite their regular season success, the team did not advance past the first round of the playoffs; they were swept 3–0 by the Los Angeles Dodgers in the National League Division Series. Lou Piniella, in his second year as the Cubs' manager, won the National League's Manager of the Year Award in 2008. In addition, catcher Geovany Soto won the 2008 National League Rookie of the Year Award. 162 September 29 @ Astros Cancelled due to the Astros being eliminated from playoff contention. With the magic number at 1, fans had their "Cubs Win" flags flying in Chicago. The Cubs and fans celebrate the 2008 National League Central Division championship. A few Cubs Win flags are visible. In 2007, Ernie Banks had requested that Evanston, Illinois native Eddie Vedder write the Cubs a song, and in August 2008 Vedder recorded "All the Way", which was released on September 18, 2008. During the season, a new version of "Go, Cubs, Go" was recorded and released by the Manic Sewing Circle, although the original 1984 Steve Goodman version became the official Cubs victory song. The Chicago Cubs were eliminated from the playoffs after Los Angeles won the series, 3-0. After losing Game 3 to the Dodgers, the Cubs lost nine consecutive post-season games, dating back to the 2003 NLCS before winning the 2015 National League wild card game against the Pittsburgh Pirates. On November 20, 2007, John McDonough stepped down as team president to join the Chicago Blackhawks. On April 23, 2008, the Chicago Cubs recorded their 10,000th victory in franchise history with a 7-6 victory in 10 innings over the Colorado Rockies. They were just the second team to complete this feat behind the San Francisco Giants. On September 14, 2008 Carlos Zambrano threw the first no-hitter for the Cubs since Milt Pappas threw his on September 2, 1972. Zambrano threw the no-hitter against the Houston Astros in a game played at Miller Park in Milwaukee. It was the first no-hitter recorded at a neutral site in baseball history. The game was moved due to the damage Hurricane Ike caused. Kaduk, Kevin (October 6, 2008). "The Nail in the Coffin: Your 2008 Chicago Cubs". Yahoo! Sports. Retrieved October 6, 2008. 1 2 Finnell, Neil (December 29, 2008). "A Look Back at Chicago Cubs 2008: Getting Off to a Strong Start". Bleacher Report. Retrieved May 11, 2014. ↑ "Regular Season Standings". Major League Baseball. Associated Press. July 14, 2008. Retrieved July 14, 2008. ↑ "Cubs tie record for most NL All-Stars". Yahoo! Sports. Associated Press. July 13, 2008. Retrieved July 14, 2008. ↑ Gano, Rick (September 20, 2008). "Chicago Cubs win Central again". Yahoo! Sports. Yahoo! Inc. Associated Press. Archived from the original on September 27, 2008. Retrieved September 21, 2008. ↑ "Cubbie jam". RedEye. Metromix. September 19, 2008. Retrieved September 20, 2008. ↑ "Manic Sewing Circle perform "Go Cubs Go"". WGNTV.com. Tribune Interactive. September 12, 2008. Retrieved September 21, 2008. ↑ "WGN Radio and Vibes Media team up to bring iconic Cubs anthem "Go Cubs Go" to mobile phones". WGN Radio. August 1, 2008. Retrieved September 20, 2008. Wikimedia Commons has media related to 2008 Chicago Cubs season.